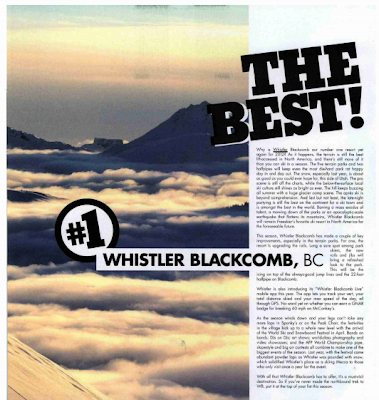 More accolades come rolling in for Whistler Blackcomb this week. Marie Brandon for Yahoo News (Oct. 21/11) - just released her “Top Five Ski Vacations in the World” which includes Whistler Blackcomb and one of our Preferred Hotel partners - the Aava Whistler Hotel. UK’s Sophie Morris (Oct. 22/11) reports on the “The 50 BEST Ski resorts” for the Independent (daily newspaper) of which includes Whistler Blackcomb. The article says, “With some of the best freestyle parks in the world and powder- heavy tree runs, Whistler is a 'must do'," says Duncan. "Many only reluctantly return to Europe following a Whistler experience. Aprs- ski is well catered for and varied, with live music, clubs and restaurants to suit all tastes. These are just a few of the reasons Whistler remains one of the most popular places for UK riders to do a season." With four “best overall” wins and eighteen No.1 “category” wins, Whistler Blackcomb cements its position as the consistently ranked No. 1 mountain resort in North America. Best Après/Nightlife: FREESKIER, onthesnow.com, SKI Magazine, TransWorld SNOWboarding, and Powderhounds.com.